by Richard E. Frye, M.D., Ph.D., John Slattery, B.A., and Stephen G. Kahler, M.D. Autism is a mysterious disorder; there is little understanding of its origin. Two of the clues that have sparked interest and elicited millions of dollars’ worth of research are the facts that children with certain well-defined genetic disorders have a greater prevalence of autism and that the recurrent rate of autism in families with children with autism is higher than in the general population. Both factors point to the possibility that a proportion of children diagnosed with autism may have a genetic disorder (or at least a high genetic contribution related to the possible cause of their autism). However, as Dr. Edelson’s editorial points out, the scientific studies that have looked at this critically have not supported an exclusive genetic theory of autism and have suggested something more complicated and perhaps much more interesting. Indeed, understanding these complications could lead us to a possible new understanding for the basis of many other diseases that have connections to autism. For the past two decades we have heard about the promise of genetics and a majority of our research funding has gone to genetic research, based on the idea that many diseases originate from errors in the genetic code. It has been over a decade since we have developed the ability to read every letter of a human’s genetic code and, at this time, it is not uncommon to sequence an individual’s entire genome to look for the origin of an unknown disease. Yet there are still many disorders whose genetic factors are poorly understood. So where have we missed the mark and what can we learn from this? First off, many children with autism have problems with the function of the mitochondria, tiny structures that are the energy power plants of the cell. Mitochondria are exclusively inherited from the mother. They have their own DNA, which helps determine how they work. It is different from the DNA in the nucleus (from both parents) that causes classical “genetic” syndromes. Complex interactions between genes and their products in the mitochondria and the nucleus occur that may lead to complicated biological cascades that promote certain disease processes. Understanding these interactions may allow us to treat what is going wrong, especially if found early enough. Second, many genetic abnormalities that are highly associated with autism are also not uncommon in typically developing individuals, suggesting that there may be a complex combination of genetic defects and/or susceptibilities that interact with environmental (non-genetic) factors as well, which need to occur in order for autism, or autism symptoms, to appear. Such interactions during critical time points in development, such as during pregnancy or early childhood, would increase the probability of disease. In the case in which a certain individual is not exposed to a particular environmental trigger at a particular time, he or she may never develop the disease. Thus, unless genetic abnormalities are studied in the context of specific environmental exposures (including the timing of these exposures) neither factor will be easy to identify. Third, it is possible that many cases that appear to be inherited do not have a genetic basis, but are due to environmental factors. For example, the major environment that is shared by siblings and twins is the mother’s womb. Interesting research has uncovered that specific immune factors in the mother’s body in response to pregnancy may directly cause autism to develop. We also know that other important maternal nutritional factors such as inadequate folate supplementation can significantly increase the risk of autism. So if the mother has the same abnormalities in the womb environment across multiple pregnancies (or a multiple-birth pregnancy), it may be these immune or nutritional abnormalities that are causing autism to develop in sibling or twin children, rather than just a shared genetic vulnerability. Lastly, it is important to realize that not all genetic disorders are inherited—in fact many genetic abnormalities are de novo, and, as Dr. Edelson mentions, it has been found that different genetic disorders can be found in siblings. This suggests that an environmental insult may have disrupted the process of copying the genetic code when the father’s sperm or mother’s eggs were originally made, potentially causing errors in the genetic material in many sperms or eggs. So different genes in different sperms or eggs could be affected. Thus, somewhat paradoxically, a genetic defect might be due to an environmental cause. Genetics is of supreme importance in understanding how the cell works and, when it doesn’t, determining what has gone wrong to cause disease. However, there appear to be other non-genetic factors that are important, which need to be taken into account. 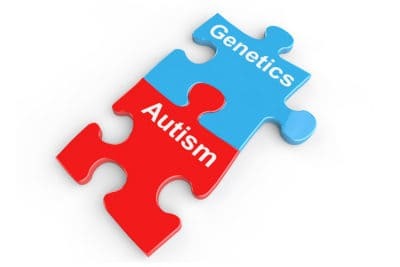 We hope that research targets will include looking at how these other factors interact with the genetic code and/or cause autism on their own so we can obtain a more complete picture of what is causing autism, and reverse the growing prevalence of this disorder.